We have always been huge fans of how Kristen Stewart works a red carpet. The actress knows exactly how to tailor her personal style to the fancy outings she frequents, and it’s a true sight to behold. Since Stewart’s androgynous fashion sense often straddles the line between business and punk, it’s particularly exciting to watch her explore new looks. We were beyond here for it when we saw Stewart rocking a very Eleven from Stranger Things look at a pre-Oscars dinner in Beverly Hills. The Twilight star wore her hair in a messy gelled style that remind us of Eleven’s ‘do. You know the episodes in Stranger Things Season 2 where Eleven meets with Kali, her long-lost sister?! Stewart’s look totally reminds us of the scene where Kali’s gang of ragtag vigilante punks give the young Millie Bobbie Brown a makeover. It’s a look that manages to channel casual punk and fashion icon all at once. 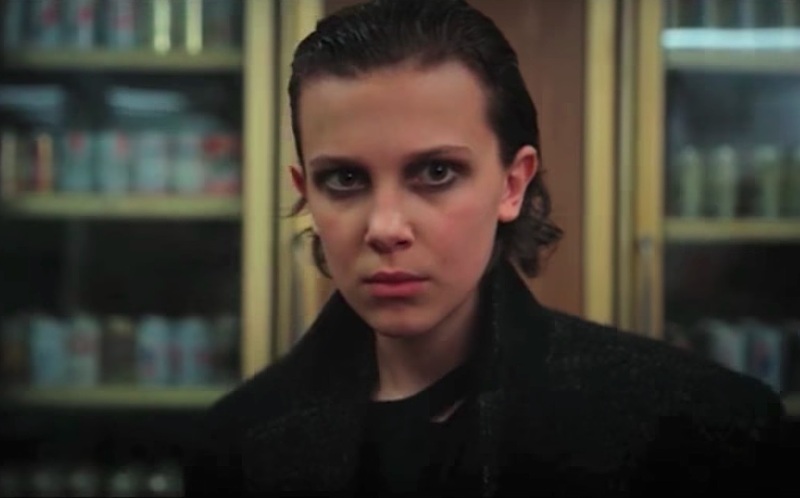 She even had on heavy eyeliner like Eleven. The look complemented her black leather jacket, thigh-high black nylons, and black and white patterned miniskirt. Also, the pointed black shoes are FIRE. If the Duffer Brothers ever need a fashion consultant for Eleven, they now know where to go. All in all, we would give this look an Eleven out of 10.